Dinsey Magic. It's hard to explain, but you know it when you feel it. Having grown up with Disney, I have felt it time and time again, in some very unexpected places. And while Disney is almost always good - it's not always magic. But when it it . . .it's amazing. Last weekend, we got to see a super secret screening of the new Disney-Pixar movie, "The Good Dinosaur". My kids don't often ask to see particular movies, but Owen made a point of telling me he really wanted to go see this one. 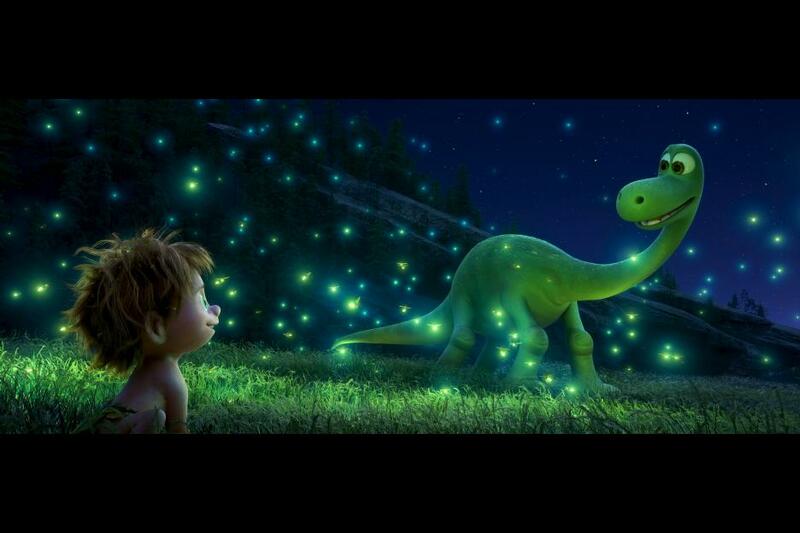 "The Good Dinosaur" asks the question: What if the asteroid that changed life on Earth forever, missed the planet completely and giant dinosaurs never became extinct? Pixar Animation Studios takes you on an EPIC journey into the world of dinosaurs where an Apatosaurus named Arlo (voice of Raymond Ochoa) makes an unlikely human friend. While traveling through a harsh and mysterious landscape, Arlo learns the power of confronting his fears and discovers what he is truly capable of. This amazing movie was directed by Peter Sohn and produced by Denise Ream (“Cars 2”). Arlo is absolutely adorable, from the moment he hits the screen. You can't help but fall in love with him. Just like Arlo's dad, you know he has the power within himself to do great things. The movie takes you on a roller-coaster of a journey as Arlo discovers just what he's made of. YOu will laugh and you will cry. As a parent, I need to share that the movie can be intense . . .no spoilers, at times I was reminded of The Lion King and of Brave. Disney does forces of nature and good vs evil better than anyone. There is one particular scene that will take your breath away - and it's hard (bring tissues). I would recommend it for kids 6 and older. In classic Disney-Pixar mode, there's a great little short before the movie. It's called Sanjay's Super Team and it's adorable! A great message and dialog opener for parents. Owen had a lot of questions about the Hindu Gods, and we spent some time looking up information about them. Planning to see The Good Dinosary this Holiday Weekend? My advice is BRING TISSUES! I am glad to hear you say 6+ - I agree completely!